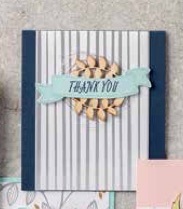 Today's instalment of Can You CASE (COPY and SHARE EVERYTHING) features the Springtime Foils Specialty Designer Series Paper that is a new product available as part of Sale-a-Bration. Did you see the new brochure featuring the new Sale-a-Bration items available for free with a $60 or $120 CDN purchase? These products that will be available until the end of March. Check them out here! This is such a cute card and so easy to make.